This is the cake for the 1st of June for my sweet baby Irina. Sweet, fresh, light and vibrant as you are. The name of this cake comes from the Russian ballerina Anna Pavlova. The origins of these cake are disputed between New Zealand and Australia, countries in which this dessert is very popular. The meringue is made and cooked following instructions in the meringue recipe. But no food coloring is used. Instead of doing small meringues, do 2 circles with a diameter of 24cm and fill them with meringue using a pastry bag. Bake the meringue on silicon sheets and let them cool. Mix the whip cream separately. 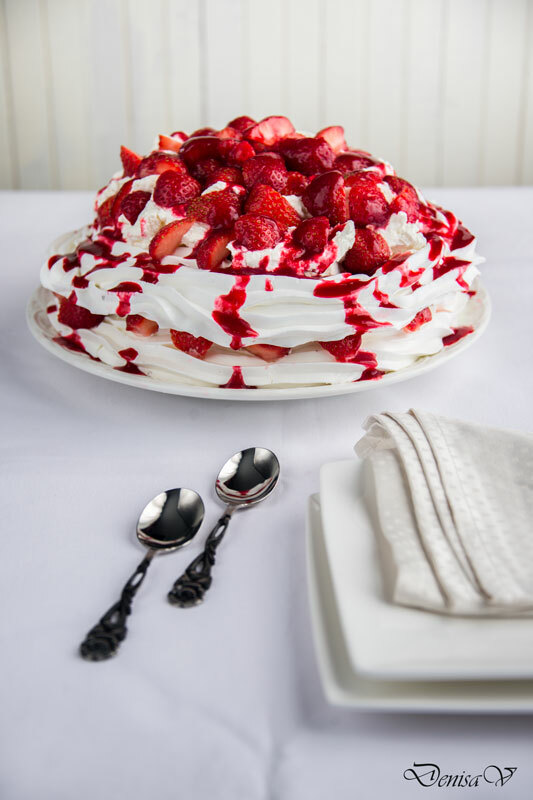 Build the cake doing layers of meringue, half of the strawberries, half of the whip cream then again, the second meringue, the remaining whip cream and strawberries.